Body and Soul by John Harvey – Book Review. The final Frank Elder installment. I must admit to being quite behind the times when it comes to the novels of John Harvey, considering he has been at the top of his game in the field of crime fiction writing since 1999, but I’m delighted to say he can now count me among his legion of fans. Harvey is best known for his series of novels about detective Charlie Resnick, which I now intend to catch up on, but Body & Soul is the concluding novel in the Frank Elder series that started with Flesh & Blood in 2004. Harvey employs an admirable and quite subtle writing style that is economical yet detailed, and thankfully devoid of the flowery filler that too often spoils novels of this genre. That in itself demonstrates his confidence in what he does, as does the sheer volume and quantity of his output. There’s a clarity to Harvey’s work, a structure and narrative that is believable and, crucially, characters that you would expect to come across in real life. Elder in particular is a cop, or now former cop, that you would want on your side, and his demons don’t define him too much, as too many do in the field of crime fiction. He is flawed, but not to the detriment of himself or those around him. 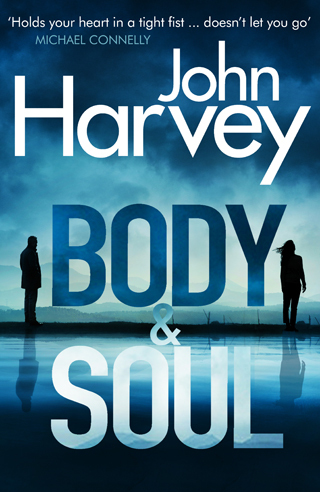 Despite me being late to the party with Harvey, Body & Soul is a novel that completely works as a standalone, even though it’s the one that is described as Harvey’s final work. That has been said before, so maybe this time, but hopefully not, he’ll stick to his retirement. The story on this occasion centres on Elder’s attempts to clear his fragile daughter of involvement in a murder, revealing his deeply human traits as he also searches for the real killer, testing his powers of self-restraint, and those around him, to the limit. The pace of the story is perfect, flowing quickly enough to make each page worth reading, while building up the strands and the characters involved in enough detail to not leave any unanswered questions. Last but not least, and obviously without giving away the ending, I have to commend Harvey for how he has wrapped up not only this individual story, but also the Elder series as a whole. So many times, especially in this genre, I feel let down by the ending. Be it either contrived, tagged on, or simply too convenient to make sense. But on this occasion, it fits perfectly and left me thoroughly satisfied, to the point of thinking afterwards that anything else would have been a disappointment or a cop out.